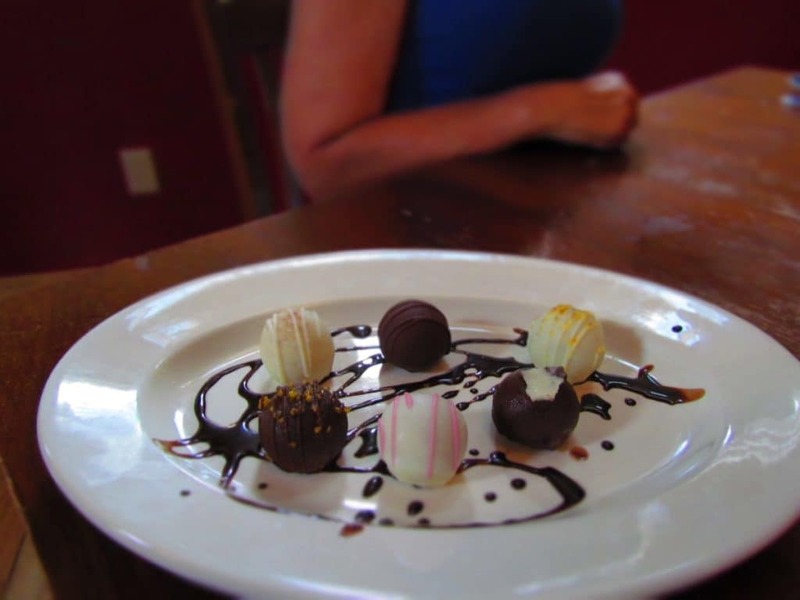 During our stay in the Amana Colonies we had an opportunity to sample every restaurant in the town of Amana. 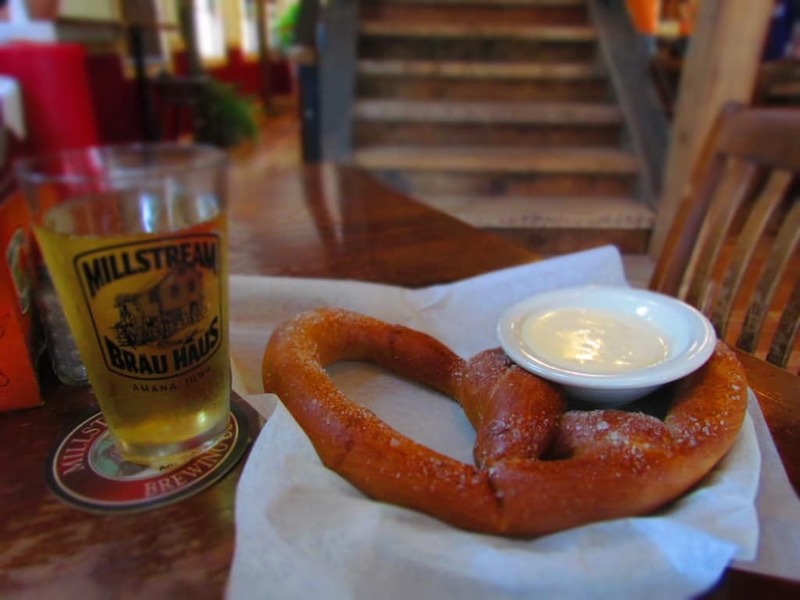 Our visit to Millstream Brau Haus (simply means “brew house”) introduced us to the oldest brewery in the state of Iowa. We had spent the morning checking out some of the unique shops around town, and had worked up healthy appetites. We want to thank the Millstream Brau Haus for their hospitality. Rest assured that all opinions are our own. It was wonderful weather for late July, and the outdoor patio was very popular. When we entered, the hostess asked if we wished to dine inside or out, and we chose an interior table. We had an extra early breakfast appointment, so our lunch break was just after the restaurant opened. This gave us a choice of seats, but by the time we left the place had filled up. 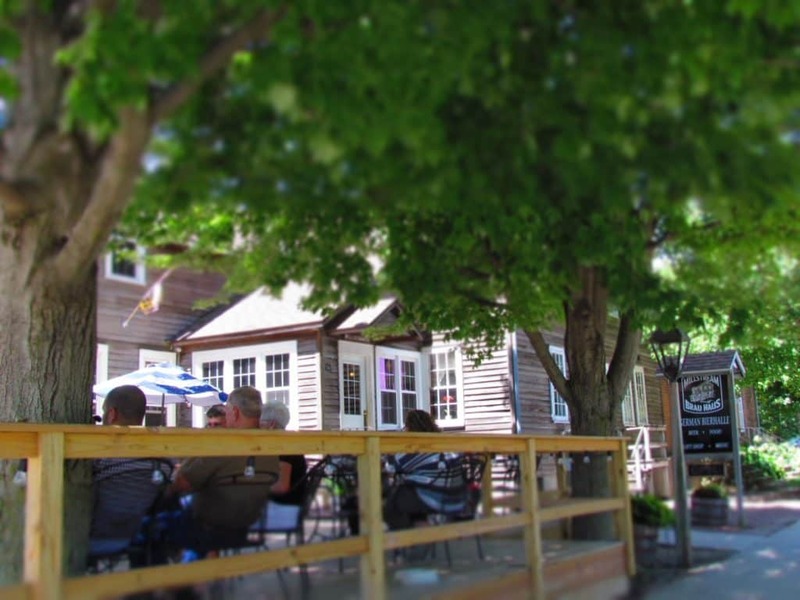 The interior of the Millstream Brau Haus restaurant is similar to many of the buildings in Amana. 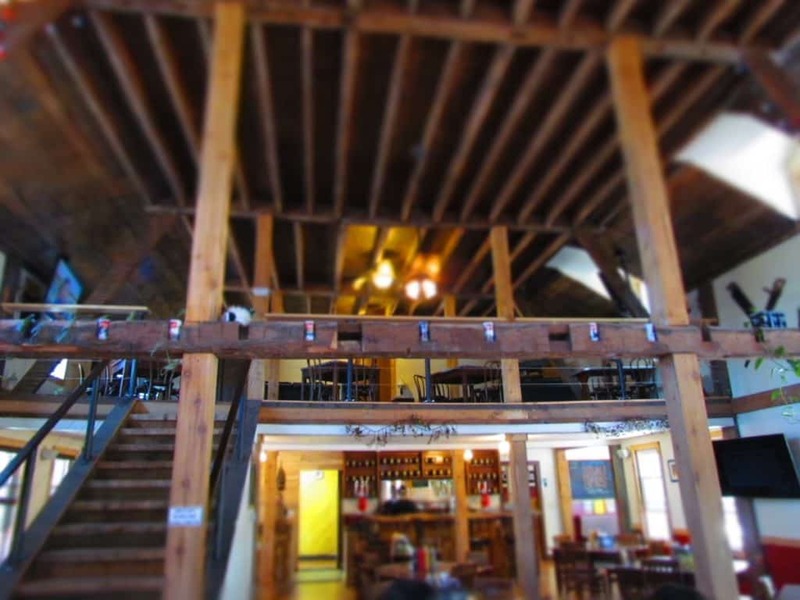 It has a rustic look and is filled with stout wooden beams. The whole place has a sturdy feel, and the age oldness is quite apparent. In its previous life it had served as the Colony Inn since 1860. That seems to be the underlying theme in Amana. Everywhere we went, everything was old and sturdy. The restaurant is a fairly new venture, which began in August of 2016. It was created with the idea of being a true German style beer hall. 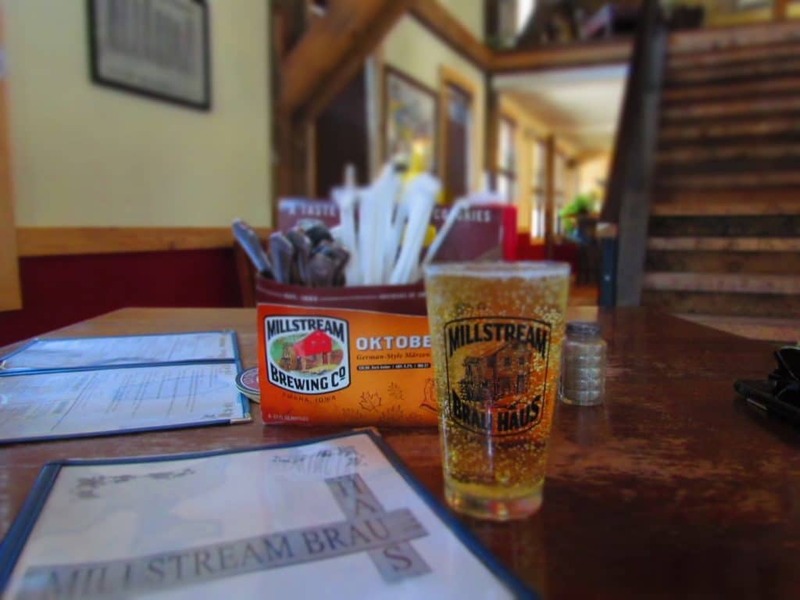 Millstream Brewery had opened its doors in 1985, which made it the first brewery to operate in Amana since 1884. The idea of creating small batch craft beers was the intent of the owners. In 2000, the brewery changed hands, and the current owners are dedicated to continuing the tradition of high quality, while introducing new beers and lagers into the Millstream family. 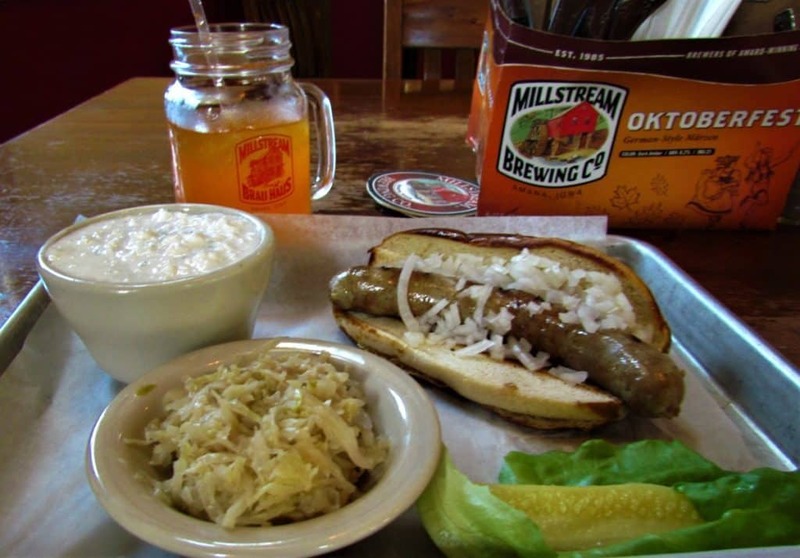 Continuing the German theme, the food at Millstream Brau Haus offers up many traditional dishes. Some have slight twists, and of course there are a few dishes more recognizable to appease those lacking a desire to be adventurous. Shortly after being seated, we were joined by Teresa Albert, one of the current owners. We also had the pleasure of meeting Lord Nathan Kula, who is the creative force behind the menu. We discussed the menu options, and decided to opt for a couple of the more traditional dishes. My choice was Chicken Schnitzel and Noodles. 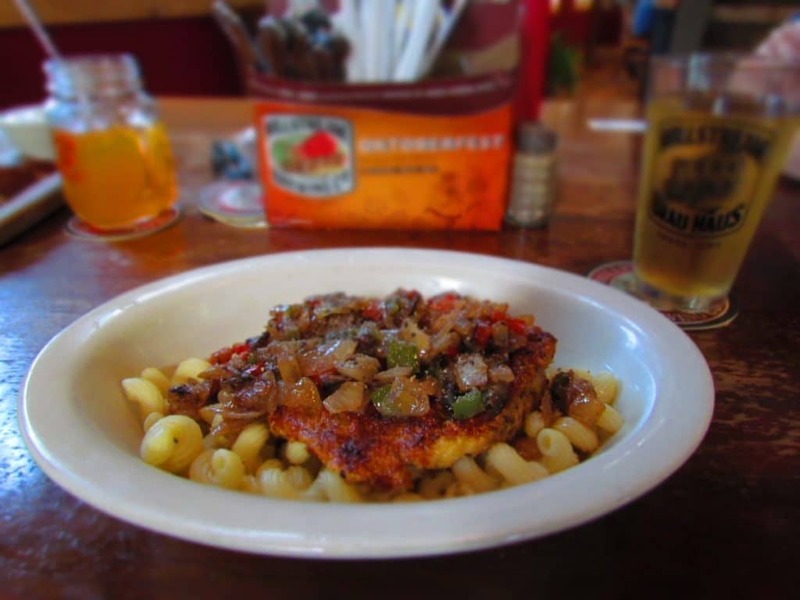 The schnitzel is a breaded chicken cutlet, and included a blend of grilled vegetables. This was served over a bed of noodles, which helped create a nice balance to the dish. It paired well with a cold draw. Crystal selected the Onion & Garlic Bratwurste, which comes from the Amana Meat Shop. (We will talk more about that place in a future article.) Her dish came with a bowl of sauerkraut, a side of cottage cheese, and a pickle. She has never been a beer drinker, so she chose an orange soda to compliment her entree. Her selection was a good choice, and the meats from the Amana Meat Shop have a flavor that is hard to top. After we finished our meals, Teresa came back by to visit some more. Much to our surprise, she was accompanied by some of the Millstream Kutchen-Truffels. (Cake Truffles) These exquisite little treats are dipped in chocolate, and each has its own unique flavor combination. Although we were already quite full, we knew it was important to test these out for research purposes. Let’s just say, that the plate was empty when we got up from the table. They were that good. Of course, we knew our next actions would be to go for a long walk, and burn off some of the German goodies we had just savored. Do you have a favorite German dish? Tell us what it is in the comments section below, so that we can add it to our list for future visits.